I’ve tried, I’ve really tried to align myself with Maurizio Sarri as the boss of Chelsea Football Club, but I have to admit I’ve failed miserably. He may, away from the limelight, be a thoroughly decent chap but, unfortunately, in his role as the gaffer, he rubs me up the wrong way. I don’t care much for this ‘Sarri-ball’ philosophy, in fact, the constant pass, pass, pass style, without moving the ball forward, bores me to tears. Although we have the occasional good game, there have been too many when the opposition, poorer quality than us opposition, has found it all too easy to stifle us. Yesterday, against Wolverhampton Wanderers, was a typical example. Our play was pedestrian, we wait far too long to move the ball forward at any pace and we constantly rely on the skills of Eden Hazard to rescue us. Against Wolves, it was the 28-year-old who again scored a sublime goal to give us a share of the spoils when it looked, for all the world, we were going to slip to an embarrassing defeat. “Hazard, as well as all the other offensive players, must learn to move the ball faster in this kind of situation. “He is able to dribble past five, six, or seven opponents, of course, he is a great player – he can resolve the situation in every moment. “When we play against a team that doesn’t want to play, we need to move the ball faster, we need more movement without the ball. “We need more movements in the space otherwise it’s impossible to score. After being constantly fouled, having to drop deep to retrieve the ball and then having to be the one to drive Chelsea forward, only to be criticised by a manager who can’t see what for most of us is plain to see, a midfield with Jorginho and Kovacic in is totally ineffective, kind of irks me. If, with the transfer ban in place, the aim is to persuade Eden to stay then perhaps a little more appreciation and appeasement as far as the jewel in our crown goes might do the trick! He’s, despite the occasional good result, out of his depth. And Zidane is back as Real boss, and we all know what Eden wants. Very bad news. It beggars belief to hear such idiotic comments from Sarri. maybe he is a super duper coach a contrast of all other specialists and supporters who can see Hazard is the lifeline of Chelsea. Instead our amazing as a leader Coach praises the likes of Jorginhio and Kovacic simply because he brought them with him. I am sorry Sarri is sour grapes and he is not fit to manage a team at premier league. He is blind and oblivious to this championship requirements. The likes of Pedro and Willian scored in the last game of Europa league but their physical strength doesn’t last when a premier league game and here we have the most crying out loud idiotic behavior of Chelse’a coach who instead of using a firing young strong lad Odoi he still sticks with Pedro and as for Kovaci and Jorginho kick them out and use Loftus. What kind of a manager is that Sarri can somebody from the administration to tell us, the supporters what is he offering to the club? YOU GUYS DON’T UNDERSTAND FOOTBALL TO EVEN UNDERSTAND SARRI’S SYSTEM. ITS TRUE THAT HAZARD IS KILLING THE SARRI SYSTEM HE NEED TO BE SOLD INCLUDING WILLIAM. SARRI IS 100% RIGHT ABOUT HAZARD HANGING ON THE BALLTOO MUCH AND LACK OF MOVEMENT FROM THE FRONT LINE. HE AND WILLIAM A LWAYS PUT SOME URGENCY IN THEIR PLAY WHEN WE ARE BEHIND, SO YOU SEE HIS GOAL CAME OUT OF DESPARATION. THE URGENCY SHOULD BE KEY IN THEIR GAME ALWAYS THAT MEANS YOU ARE HUNGRY TO ACHIEVE GREATER HEIGHTS. REST MY CASE. U ar absolutely right…. 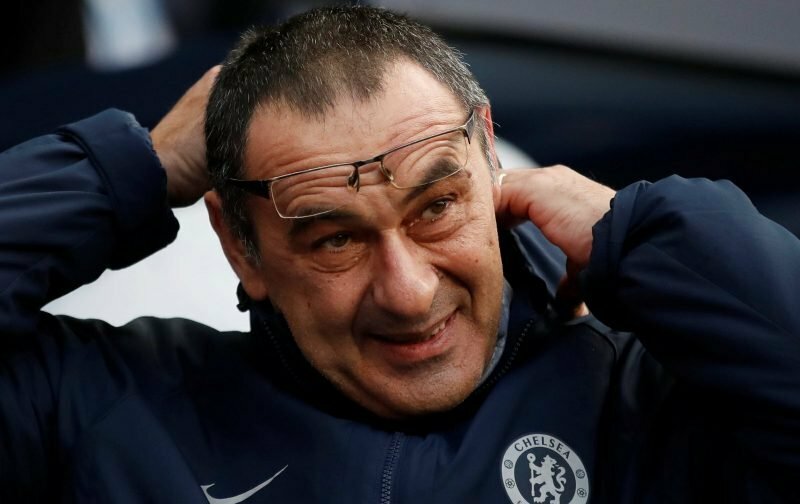 D problem is not sarri…. As for me d midfield duals played very well… But d front men ar been wistful.. The likes of Pedro as waisted 3 assist set by joginho to him… Hazard already said it dat he will frustrate sarri…. His philosophy is very good.. Dat y d likes of pep gadiola confirmed it at d previous meeting wit Chelsea, wen dey beat Chelsea 6 nil. Dat he knws wat sarri was trying to do.. Look as d likes of Manchester City, pep had to bring in his own kind of players who could understand his philosophy and implement it befo he could thrive.. If hazard willian and Pedro remains in dat club.. Dey will always want tins done in dere way.. Which is not hw a football club should be… The manager should decide wat he want and implement it.. If d likes of hazard, Pedro and willian keep deciding for the manager den I don’t tink we need a manager at the club..
what is “sarri-ball”? may be something like pointless, toothless, boring kick about, advertised as supreme football philosophy. or may be the right questions to ask are: who brought this clueless clown to chelsea? who treated conte like dirt? who bought back Luiz, who keeps destroying chelsea’s season with impunity? who failed to sign koulibali, van dijk, alex sandro, lukaku? who brought in miazga, zappacosta, jiloboji, drinkwater, bakayoko and idiotically sold salah, lukaku, de bruyne? who signed shevchenko, torres etc.? chelsea is no more, sadly.